My stance is that I stand right here. I stand where my ancestors stood; on the same earth, in the same spot. When we have our Tour and Train programs in Israel I often bring our students to Masada – Mt. 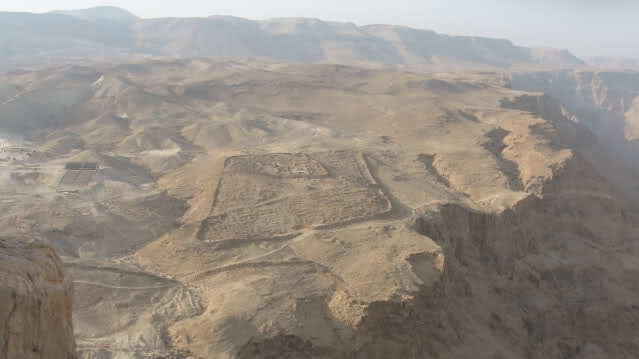 Masada, the remains of the great fortress of Masada. It is but a short distance from my home, and always in my heart. Nearly two thousand years have passed, the ground surrounding Masada is now silent, but the echoes remain. At Masada 960 Jews, the survivors of Rome's war against the Jews, stood and made their last stand. They stood for freedom. They stood against foreign occupation, tyranny and exploitation. They stood tall and proud. Our people wanted to live in accordance with our ancient laws but the Roman rulers abused the law and the people, and eventually, when our people could take no more - they revolted. In the year 66 the patience of our people came to an end and they openly revolted against the most powerful empire on earth. With the destruction of our Holy Temple in the year 70 all hope seemed lost, but a few faithful warriors remained. 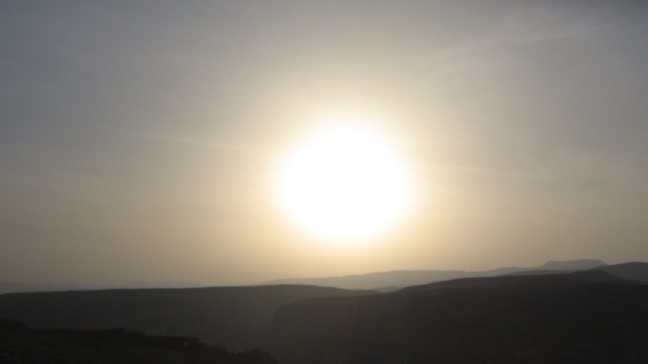 They found their way to Masada, deep in the Judean desert, high on a mountaintop. The famous Roman Tenth legion was given the task of finishing off the rebels. 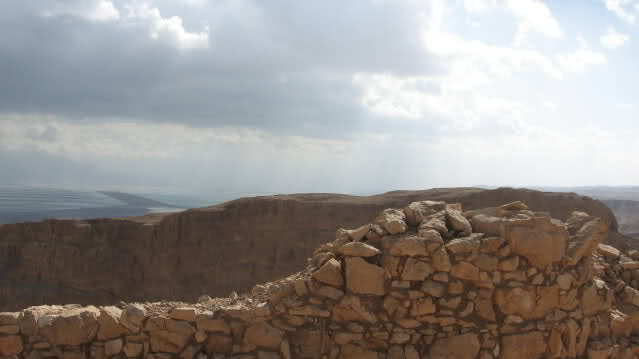 The remains of the walls of Masada. The Roman tenth legion passed by where my house now stands. Had I been alive then I would have seen them clearly in their military formations, marching towards Masada. How invincible they must have felt. If only they knew that 2,000 years later all that would remain of them would be a few arrow heads, broken artifacts, and a partial paycheck of a Roman centurion, but that Jewish homes would stand on these mountains - Had they known this perhaps they would have rethought the worthiness of the attack. I stand here where my holy ancestors stood. I speak the same language, I read the same texts. I share the same vision. The time has passed, these warriors are gone, but are they? What happens when a man dies? Where does he go? Some believe you return to the earth and that is the end of the matter, others believe the soul is eternal and comes back with new life. Whatever it may be I feel those proud Jewish people here. They are in the sand dunes, they are in the hills, they are in the wind. Their bodies may have passed from this earth long ago but their spirit still resides here. Their spirit has waited quietly for our return, and someday our spirits will be joined here with theirs. We are this land, we are this wind, we are these stones we are this sand. What remains of a mans' struggles? What remains of his hopes? I have stood on Mt. Masada and wondered. I have imagined them there – religious Jews, praying and preparing for war, looking down on the invaders who felt a need to come from so far away and destroy our way of life. I think of Angelo, a guard at the Maaleh Adumim mall, whose family was taken away in chains to Rome 2,000 years ago. He now lives here, just a short distance from where all this took place. He is home. Where does he stand on these "issues"? Where does he stand?! He stands where his ancestors stood before they were forcibly exiled. I imagine the hopeless feeling in the hearts of my ancestors; the Holy Temple in Jerusalem destroyed, hundreds of thousands dead, and the end approaching fast. What hope was there? I stand here where they stood, but I have a different set of circumstances. I see Jerusalem being rebuilt; I see the exiled coming home from Russia, and Yemen, and Ethiopia and the United States. I see hope. And I pray that their souls are still here, as I feel they are, and these souls can rejoice that their efforts were not in vain. They may have died but their spirit and efforts were ingrained in this land and in our memories forever. Their souls yet live. We walk the same earth, we feel the same sun and we stand where they have stood. It is told that the Jews of the Warsaw ghetto, before they revolted against the most powerful army of their time, were inspired by an poem about Masada. Truly the spirit of our brave warrior ancestors has survived! 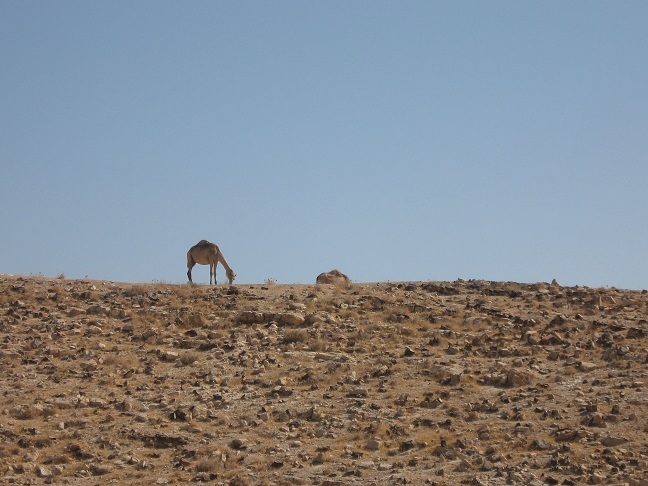 It was with us in the exile while it remained here and stood guard over the fortress known simply as Masada. Truly these dried out bones shall live! Truly the spirit of our Freedom Fighters lives! 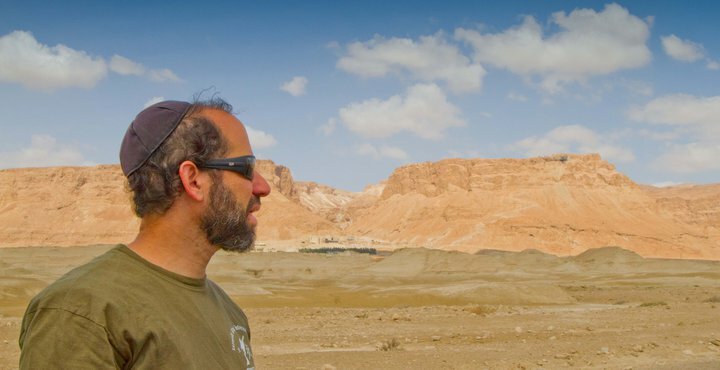 I love the article, I find Masada the most intriguing part of our Jewish history, thank you for sending me this blog, I love it."